“zoned for industrial or similar purposes in planning instruments. They are generally lower density employment areas containing concentrations of businesses involved in: manufacturing; transport and warehousing; service and repair trades and industries; integrated enterprises with a mix of administration, production, warehousing, research and development; and urban services and utilities”. Since 2008, Employment Lands have been categorised into precincts for Greater Sydney and the Central Coast. These Employment Land Precincts were initially defined along industrial zone boundaries. Due to the implementation of the Standard Instrument Local Environmental Plan, these precincts may now include other business zones which permit a number of industrial uses. Employment Land Precincts are tracked separately under the Employment Land Precincts sub tabs. For the third year, the Employment Lands Development Monitor (ELDM) has tracked the total stock and development status of all B5 Business Development, B6 Enterprise Corridor and B7 Business Park zoned land, in addition to all industrial zoned land, under the Standard Instrument Local Environmental Plans in the Greater Sydney and Central Coast region. This includes all related lands within the Employment Land and Business Park precincts. This year, the ELDM has expanded the Land Supply Monitor component to include the Illawarra-Shoalhaven Region, in addition to including the Hunter Region for the first time last year. Under the Standard Instrument Local Environment Plans in the Greater Sydney, Central Coast, Hunter and Illawarra-Shoalhaven Regions. 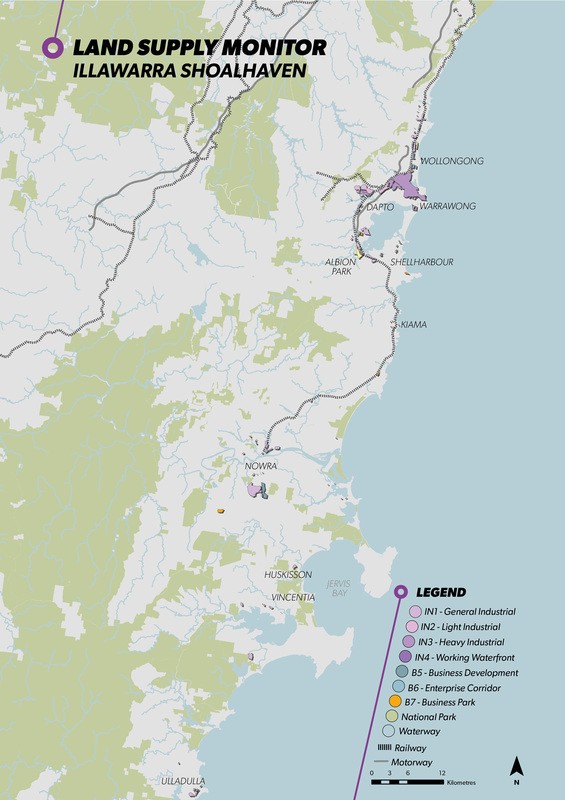 The Hunter and Illawarra-Shoalhaven Regions also include Special Use zones for the Port and Airport. 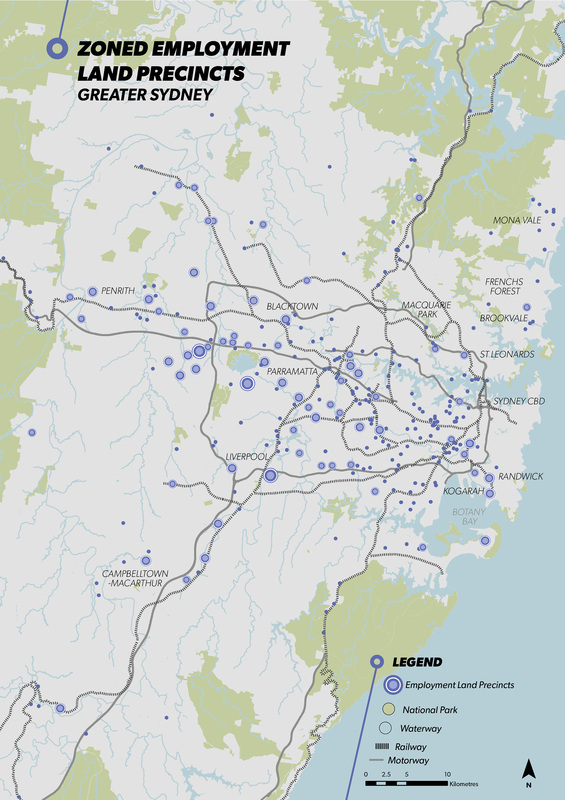 Greater Sydney comprises the five districts as outlined in the Greater Sydney Region Plan – Eastern City district, Central City district, Western City district, North district, and South district. At January 2018 there was 12,224 hectares of industrial zoned land and 2,773 hectares of business zoned land in Greater Sydney. Most zoned, but undeveloped employment lands in Greater Sydney is zoned IN1. Over 57 per cent (1,677 hectares) of the total undeveloped zoned land stock is contained in just 46 lots of over 10 hectares in size. The majority of these lots are located in the key precincts of Marsden Park, Eastern Creek and South of Sydney Water Pipeline, and are predominately zoned IN1 General Industrial. Of the total undeveloped zoned land contained in Employment Land Precincts, 646 hectares were serviced with water and sewer lead-in services at January 2018. This is a decrease of 17 hectares from January 2017. Since 2008, Employment Lands have been categorised into precincts. These Employment Land Precincts were initially defined along industrial zone boundaries. Due to the implementation of the Standard Instrument Local Environmental Plan (in 2006), these precincts may now include other business zones which permit a number of industrial uses. At January 2018 there was 13,755 hectares of total zoned employment land contained in Employment Land Precincts across Greater Sydney. This is a decrease of 71 hectares from the previous year. Of the total zoned employment land stock contained in Employment Land Precincts, 21 per cent, or 2,937 hectares were undeveloped as at January 2018. This is a decrease of 95 hectares from January 2017. In 2017 there were 28 hectares of industrial zoned land (IN General Industrial, IN2 Light Industrial, IN3 Heavy Industrial or IN4 Working Waterfront) added through rezoning in Employment Land Precincts across Greater Sydney. This occurred at Menangle Park in Campbelltown. 22 hectares of industrial land was rezoned for non-industrial purposes in 2017, including 8 hectares at the old Bonds Spinning Mill site at Pendle Hill in Cumberland and 5 hectares in the Northern Beaches suburb of Cromer. A further 73 hectares were rezoned from Deferred Matter (DM) to Business Park (B7) at Werrington and St Marys in Penrith. In 2017 there were eight planning proposals approved at the Gateway*. The finalisation of five of these proposals would result in the loss of around 58 hectares of employment land. The other three planning proposals would result in a minor gain of three hectares of employment land once finalised. In 2017 there was one proposal lodged, but not yet determined, relating to employment lands. If finalised, this proposal would result in the net loss of 10 hectares of employment land. In addition to existing zoned employment lands, there were 6,654 hectares of potential future employment lands as at January 2017. The majority of these future areas are identified in the South West Growth Centre Structure Plan and A Plan for Growing Sydney. Not all these lands may be developable. These areas are subject to further investigations at the precinct planning stage to assess suitability for development. This will consider a range of constraints such as riparian corridors, topography, vegetation, transport corridors, local roads and lot fragmentation. 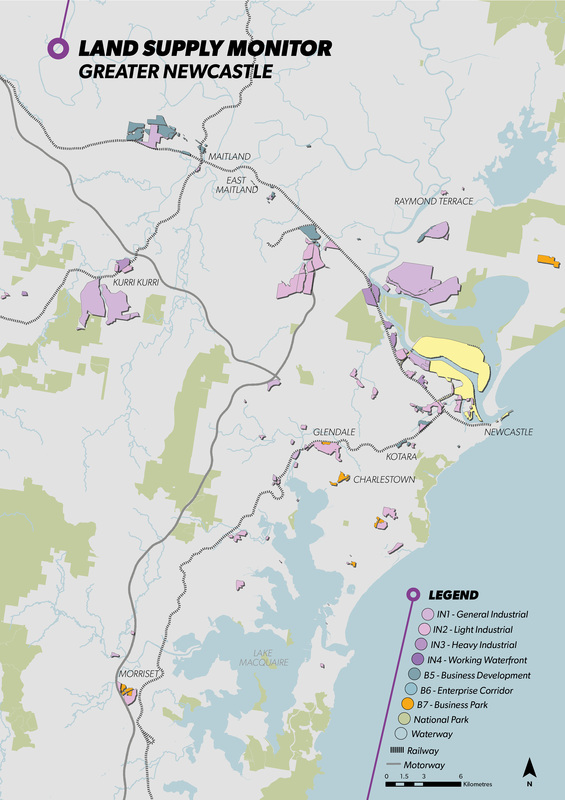 The Central Coast comprises the Central Coast Local Government Area (previously reported as the Gosford and Wyong Local Government Areas). At January 2018 there was 1,857 hectares of industrial zoned land (IN1 General Industrial, IN2 Light Industrial, IN3 Heavy Industrial and IN4 Working Waterfront), 86 hectares of B5 Business Development zoned land, 113 hectares of B6 Enterprise Corridor zoned land and 49 hectares of B7 Business Park zoned land in the Central Coast region. Over 62 per cent (670 hectares) of the total undeveloped zoned land stock is contained in just 28 lots of over 10 hectares in size. The majority of these lots (17) are located in Bushells Ridge and are zoned IN1 General Industrial. Of the total undeveloped zoned land contained in Employment Land Precincts, 289 hectares were serviced with water and sewer lead-in services. Most of the undeveloped and serviced land was at Somersby (98 hectares), Wyong (89 hectares) and North Wyong (43 hectares). Since 2008, Employment Lands have been categorised into precincts. These Employment Land Precincts were initially defined along industrial zone boundaries. Due to the implementation of the Standard Instrument Local Environmental Plan, these precincts may now include other business zones which permit a number of industrial uses. At January 2018 there was 1,994 hectares of total zoned employment land across the Central Coast contained in Employment Land Precincts across The Central Coast Region. In 2017 there were no Planning Proposals approved at the Gateway* relating to employment lands in the Central Coast. In addition to existing zoned employment lands, there are 467 hectares of potential future industrial land identified in the North Wyong Structure Plan. The Hunter comprises the 10 Local Government Areas of Cessnock, Dungog, Lake Macquarie, Maitland, Mid-Coast, Muswellbrook, Newcastle, Port Stephens, Singleton and Upper Hunter. The Region also contains the Greater Newcastle Metropolitan area which comprises Cessnock, Lake Macquarie, Maitland, Newcastle and Port Stephens Local Government Areas. This is the second year that the ELDM has reported on the Hunter Region. This includes all industrial, B5 Business Development, B6 Enterprise Corridor and B7 Business Park zoned land, and Special Use zones related to the port and airport. No individual employment land or business park precincts have been identified. Almost 80 per cent of this land is within the Greater Newcastle Metropolitan area (Cessnock, Lake Macquarie, Maitland, Newcastle and Port Stephens Local Government Areas). Of the total undeveloped zoned land, 3,586 hectares were serviced with water services (within 30 metres of a water main). Most of this land was located in the Greater Newcastle Metropolitan Area (2,924 hectares), including Cessnock (917 hectares), Port Stephens (892 hectares) and Newcastle (753 hectares). In 2017 there were no Planning Proposals approved at the Gateway* relating to employment lands in the Hunter Region. The Illawarra-Shoalhaven comprises the four Local Government Areas of Kiama, Shellharbour, Shoalhaven and Wollongong. This is the first year that the ELDM has reported on the Illawarra-Shoalhaven Region. This includes all industrial, B5 Business Development, B6 Enterprise Corridor and B7 Business Park zoned land, and Special Use zones. No individual employment land or business park precincts have been identified. Almost 61 per cent of this industrial land is located in the Wollongong Local Government Area, while 64 per cent of the business zoned land is in the Shoalhaven Local Government Area. Of the total undeveloped zoned land, 383 hectares were serviced with water services (within 30 metres of a water main). Most of this land was located in the Shoalhaven Local Government Area (227 hectares) and the Wollongong Local Government Area (149 hectares). In 2017 there were no Planning Proposals approved at the Gateway* relating to employment lands in the Illawarra-Shoalhaven Region.